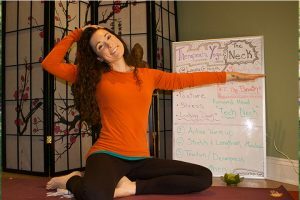 This is a short yoga sequence to work on the 4 main components of a healthy neck program. This includes starting with an active warm up to improve circulation and awareness of tension. Next, we move into longer held stretching to decrease muscle tension and calm over active muscles. Once we have created space then we use gravity to create a gentle traction effect on the neck. The sequence ends with a few movements to emphasize proper posture and the strength needed in the neck muscles to stay in good alignment. Please note, this sequence is designed to address general neck tension and is NOT appropriate for those with specific orthopedic or neurological conditions such as herniated disks. If you have a specific neck condition or experience sharp pain/ tingling consult a therapist for a specifically designed neck program. If you are experiencing recurrent neck tension it is important to do some investigation into the source of the neck tension. Very often it is a postural habit, such as looking down at a cell phone or lap top computer that strains the neck. Other contributing factors include the amount of stress you are experiencing, your sleeping position or your movement patterns. 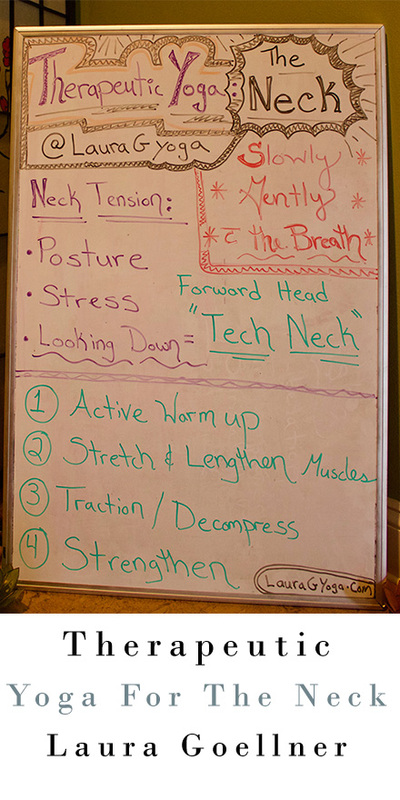 Once these factors are addressed you should see a decrease in the amount of neck tension you are experiencing day to day.